The dynamic relationship between art and theology continues to fascinateand tochallenge, especially when theology addresses art in all of its variety. 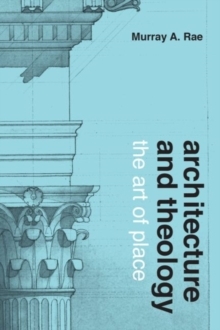 In Architecture and Theology: The Art of Place , author Murray Raeturns tothe spatial arts, especially architecture, to investigate how the art forms engaged in theconstruction of our built environment relateto Christian faith. Rae does not offer a theology of the spatial arts, but instead engages in a sustained theological conversation with the spatial arts. Because the spatial artsare public,visual, and communal, they wield an immense but easily overlookedinfluence. Architecture and Theology overcomes this inattention by offering new ways of thinking about the theological importance of space and place in our experience of God, the relation between freedom and law in Christian life, the transformation involved in God's promised new creation, biblical anticipation of the heavenly city, divine presence and absence, the architecture of repentance and remorse, and the relation between space and time. In doing so, Rae finds an ample place for theologyamidst the architectural arts.